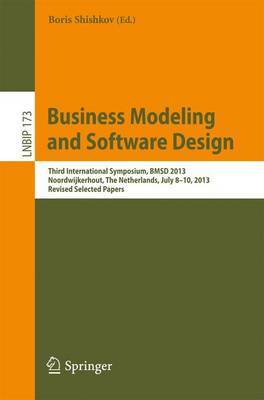 This book contains the extended and revised versions of selected papers from the Third International Symposium on Business Modeling and Software Design (BMSD 2013), held in Noordwijkerhout, The Netherlands, during July 8-10, 2013. The symposium was organized and sponsored by the Interdisciplinary Institute for Collaboration and Research on Enterprise Systems and Technology (IICREST), in cooperation with the Dutch Research School for Information and Knowledge Systems (SIKS), the Center for Telematics and Information Technology (CTIT), Aristotle University of Thessaloniki (AUTH), and AMAKOTA Ltd. The theme of BMSD 2013 was "Enterprise Engineering and Software Generation." The 13 full and 20 short papers presented at BMSD 2013 were selected from 56 submissions. The eight papers published in this book were carefully reviewed and selected from the 13 full papers. The selection includes papers touching upon a large number of research topics, ranging from more conceptual ones, such as modeling landscapes, process modeling, declarative business rules, and normalized systems to more practical ones, such as business-case development and performance indicators, and from more business-related topics, such as value modeling and service systems, to topics related to information architectures.